Genuine Soft Real Lambskin Leather Throw Pillow Cushion Cover Handmade 20x20"
Indian Festive Sofa Decor Pillow Case Patchwork Cotton Cushion Cover 2pc Set 20"
Decor Cushion Cover Indian Hand Art Patchwork Cotton Pillow Case Set of 2 pc 20"
Age 30-60 years old the original kilim is made of finest wool and cotton. And it has natural dye. The back part of the pillow is cotton fabric and closed with an invisible solid zipper. Size: 20"X20". Custom Handmade 20" x 20" square Pillow Cover with matching welt edge Stunning Pastoral Distressed Style Antique looking "Billard" red and blue Covington Bosporus Toile fabric, with toile welted piping edge, tannish gold nobby textured linen blend fabric on reverse, with hidden bottom zipper closure. This is for the COVER ONLY, no pillow insert. Free shipping!!. Cover Sofa Couch. in this cover. Material - Taffeta Silk ( Silk Blend). 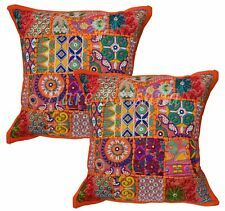 Silk Cushion is from Banaras,India. One Stunning Handmade Dupioni Silk Cushion/Pillow. The picture shown is a representation of the item. It is satisfying to use. Material:100% Wool. A perfect combination of colors that give any space look cohesive and inviting. This service is fast and secure. Kilims are quickly gaining popularity. Custom Handmade 20" square Pillow Cover (to use with your own 22" pillow insert) Stunning Pastorial Kravet Couture Toile called Guinevere Festival in ivory, backed with Kravet diamond textured fabric, edges detailed with designer mingled tassel fringe trim. Bottom invisible zipper opening. This is for the COVER ONLY, no pillow insert. Custom made in our smoke and pet free studio workroom. Cover Sofa Couch. in this cover. Material -Dupion Silk or Dupioni Silk ( Silk Blend). Silk Cushion is from Banaras,India. 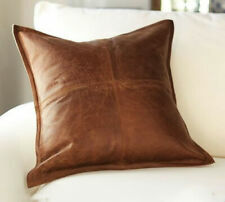 One Stunning Handmade Dupioni Silk Cushion/Pillow. The picture shown is a representation of the item. (This is an industry standard and results in a snug, professional fit. We are happy to accommodate:). Self Welt - Piping. Insert is not included. Cover Sofa Couch. in this cover. Material -Taffeta Silk ( Silk Blend). Silk Cushion is from Banaras,India. One Stunning Handmade Dupioni Silk Cushion/Pillow. The picture shown is a representation of the item. GORGEOUS GRAY EMBROIDERED Otomi Indian Pillow Cover 20 x 20" FAB! I carry a large inventory of many different colors and each is one of a kind. That's the real bonus of this particular collection. Don't forget to stuff the corners! No two are alike. These are handmade and I use the thickest embroidery yarn so that it gets a textural effect to the images. Each is a unique image including insects, fauna and fantasy animals. These amazing pillows will add a POP to any room design. 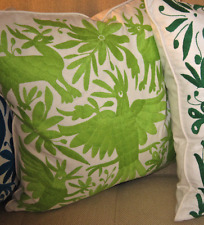 The Otomi Collection is available in many color ways. All i can say is WOW! Bright colors of wool adorn the front of the pillow and the cotton back has a hidden zipper enclosure.Makes a gorgeous addition to any couch, chair or bed. THE INSERT IS NOT INCLUDED. Care: Dry Clean Only! Size: 20"X20". Age 30-60 years old the original kilim is made of finest wool and cotton. And it has natural dye. The back part of the pillow is cotton fabric and closed with an invisible solid zipper. This is a lovely red and Beige Toile fabric in a shade of burgundy red and beige. This also has a zipper opening for easy clean up. This will fit an 20" x 20" pillow insert. Pillow insert is not included in the sale. 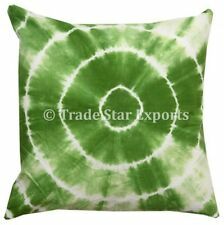 Item - Cotton Cushion Cover (No Filler Includes). Our Cushion Covers & Rugs are Hand-woven & is made from old technique of Making KILIMS by Tribes of Rural India. Wash Instruction - Hand Wash / Dry Wash. I carry a large inventory of many different colors and each is one of a kind. That's the real bonus of this particular collection. The Best Made Pillow on the Web. Don't forget to stuff the corners! 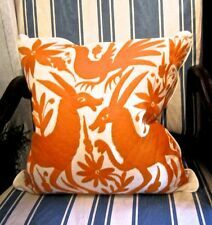 ThePREFECT BEIGE hand embroidered Otomi Pillow Cover. 20 x 20" with cotton duck backing and piping. There is a Hidden Zipper on the bottom of each pillow. This color way is so fresh and always adds in any interior. Age 30-60 years old the original kilim is made of finest wool and cotton. And it has natural dye. The back part of the pillow is cotton fabric and closed with an invisible solid zipper. Pillowcases send without insert you can use your insert in it. 20" x 20" Happy, Country-flair Plaid in shades of Reds, Greens, Amber Yellow-Gold, and Vanilla. 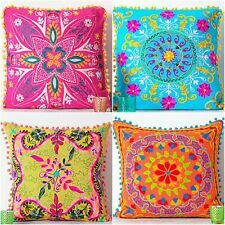 NEW, literally ONE-OF-A-KIND, unique and original Designer Decorator Pillows, never duplicated, nor mass produced multiples. These are 20 x 20" square pillow covers that have a hidden zipper and a brilliant welting detail cut on the biased striped used on the edges. I have used the fabric on both sides and they are a perfect match. PERFECT PINK Hand EMBROIDERED Otomi Pillow Cover 20 x 20" Cotton FAB! I carry a large inventory of many different colors and each is one of a kind. That's the real bonus of this particular collection. You might find less expensive examples of this pillow, but you won't find one as well crafted as this collection. Bright colors of wool adorn the front of the pillow and the cotton back has a hidden zipper enclosure.Makes a gorgeous addition to any couch, chair or bed. Just too beautiful hand dyed Shibori Tie Dye Square cushion cover. The versatility of this gorgeous pillow is limitless. Bold, fun and effortlessly cool, these pillowcases are soft and smooth, made from 100% cotton. 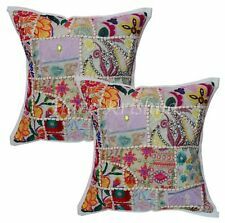 Moroccan Pillow Cactus Silk Cushion Vegan Silk Sabra Pillow Cover. ☆Do you fancy vegan silk?. Yes you read correctly! It exists, vegan silk made entirely from natural materials. ► Care instructions: dry cleaning, the natural fiber does not like water.